New And High Quality Genuine AL14A32 Battery for Acer Aspire E1-571 E1-571G Series Laptop (Li-ion 11.1V 5000mAh) In Singapore . Welcome buy genuine al14a32 battery for acer aspire e1-571 e1-571g series laptop on our store. E5-411, E5-421, E5-421G, E5-471, E5-471G, E5-511, E5-511G, E5-511P, E5-521, E5-521G, E5-531, E5-551, E5-551G, E5-571, E5-571G, E5-571P, E5-571PG, E5-572, E5-572G, V3-472, V3-472G, V3-572, V3-572G, V3-572P, V3-572PG, V5-572, V5-572G, V5-572P, V5-572PG. 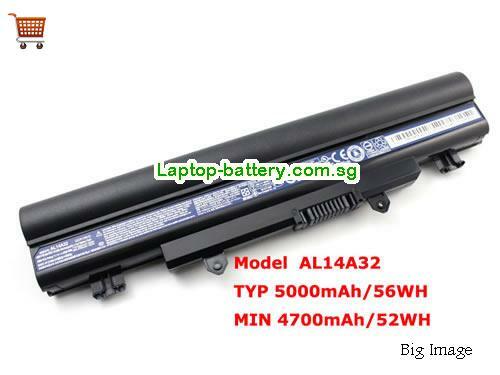 How can i sure this Genuine AL14A32 Battery for Acer Aspire E1-571 E1-571G Series Laptop is the correct one i need? Other usefull knowledge for find a correct ACER laptop battery. 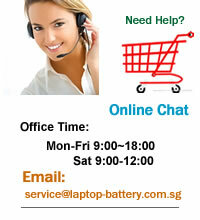 Try search with the laptop model or battery number on our site, you can find it easliy. Tell us your laptop model or the battery number when you fill the shipping information will help you get a correct item. . Check the correct item customer bought. Check battery appearance and interface. Test battery charger and recharger function. Charger battery to 100% and recharger to 0% to get real battery capacity. Charger power more than 30%. Package carefully and send out.